This article discusses the best practices and functionality of DivvyHQ's custom workflow features. No matter what type of content you are producing, every piece of content has to go through some sort of workflow process to get it done. And getting it "done" probably isn't even the last step in "the process". DivvyHQ includes a variety of workflow tools to allow teams to either keep things simple, or get very specific...whichever each situation (or each team) requires. For starters, DivvyHQ has a basic workflow baked into the application. Each content item has a "Content Status" field that includes the states shown below. 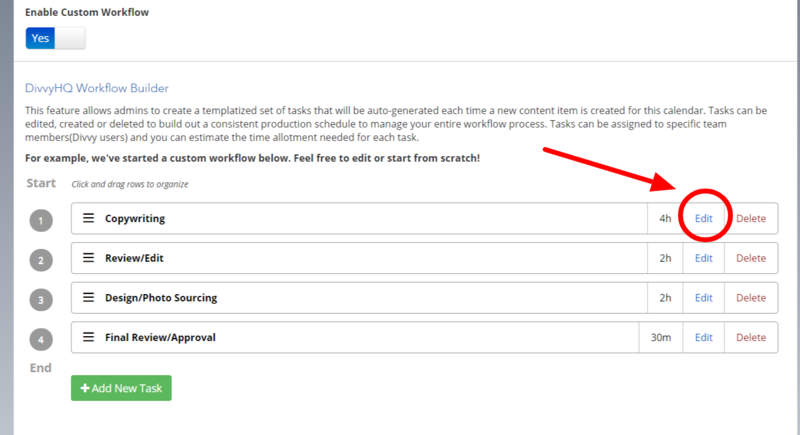 Each content item can be moved through this workflow by updating the status field within each content item. DivvyHQ also includes a task management layer that sits underneath each content item. So individual content items can have tasks, much like a project management system has projects and tasks. Individual tasks can be created when working with content items within the sandbox interface. Enterprise and Pro accounts have the ability to create a custom workflow for each calendar, which can be used to establish a consistent workflow template for different types of content. For example, producing a blog post might consistently require the following steps: first draft, source a photo, initial review/editing, final review, post to Wordpress. Building this workflow template automates the process of creating individual tasks for each content item (a big time saver). Additionally, specifying "average duration" automates deadline scheduling for each task, so you'll actually have a better chance of completing your content on time! 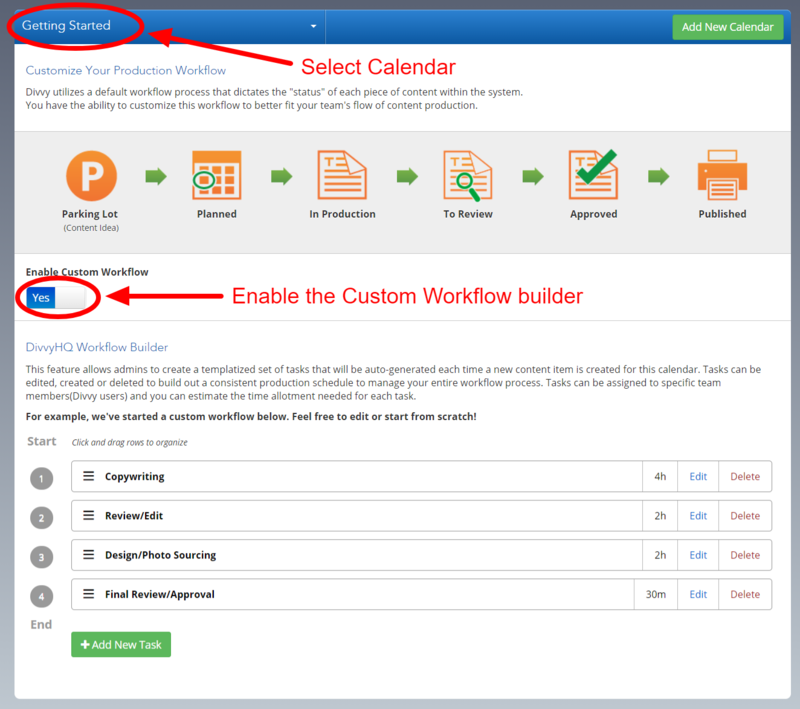 To create a custom workflow for an individual calendar, follow the steps below. Within the Calendar Admin, click the Workflow tab. Choose a calendar from the Calendar drop-down menu. Enable the Custom Workflow option via the toggle for that calendar. Start adding or editing your production steps. You can add and edit as many tasks as you wish. To add a new task just click the green Add New Task button. This will be bring up the Add/Edit Task overlay. 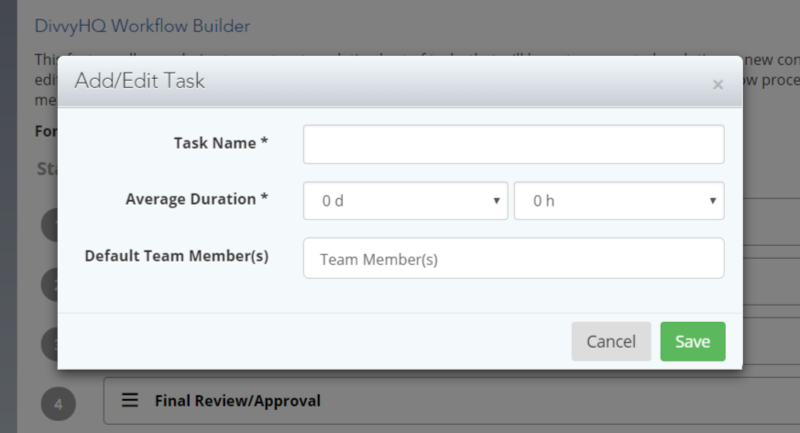 Within this overlay you can give the task a name, an average duration (how long it typically takes to complete this step), and assign it a default team member(s) if you wish. Once you have everything in place for the Task, click Save, and it will be added to that calendar's workflow. To edit an existing production step, simply click its corresponding edit button (screen below) to bring up its Add/Edit Task overlay. Once you've added and edited your production tasks to your liking for each calendar, that task template will auto-populate each time you create a new content item. Can I create and add my own content types?